In between two desperate lunging headers, there was calmness, as Olivier Giroud put to bed a nightmare week to send Arsenal on their way to a 2-0 victory over Everton. His goal was trademark Giroud: a dash to the near post before guiding the ball into the bottom far corner. His other key trait, his heading, can fluctuate wildly as from outside play, Arsenal rely on his aerial prowess heavily; however, in front of goal, desperation seems to kick-in, as if scoring them should be a norm for him. Still, his greatest ability is perhaps his determination, as Arsene Wenger alluded after the win; that he kept searching for the chance. The whole team too needed to respond and they did, although this was probably a more promising step forward than the other “reactions” we have witnessed this season following setbacks. Previously, the response has been for Arsenal to stand off and cede possession just to give a little solidity to their defensive game in that sense, the Monaco game was a bit of an aberration, where the Gunners totally dominated) and although here, Wenger said “we could do better with the ball”, The Gunners were more proactive in their approach without it. As such, the game was more or less even (possession 48%/52%): when one team attacked, the other tended to press early then drop back into a compact shape. As 7amkickoff noted on Arseblog News, tackles (11-12), territory (50.5% – 49.5%), crosses (26-24), corners (8-9), seem to corroborate that but Arsenal were far more purposeful in the attacking third. The early period, between 15-20 minutes, was dominated by Everton. Perhaps that was to be expected because Arsenal were always going to be a bit cautious after the 3-1 defeat to Monaco in midweek. On the other hand, Everton made it difficult for Arsenal to really gain a foothold in the match by being a bit risk-free themselves on the ball, stretching the pitch with the full-backs and looking to lure Arsenal out. At times it worked, especially when they bypassed Arsenal on the flanks and had The Gunners forward players turned. It probably hints at Arsenal’s weakness as much as Everton’s strength when they push Seamus Coleman and Luke Garbutt forward because Arsenal’s press is not entirely co-ordinated. It’s not unusual to see the forward players – namely Alexis Sanchez – gesticulate and cajole their team-mates to push up the pitch though no-one follows, or if they do, they usually do it with a brief burst of intensity. Indeed, Alexis’s pressing should be the signal for Arsenal to up their intensity; instead as he goes by himself, it often shows up the rest of the side, or has the unwanted effect of exposing the midfield. That’s the issue with Arsenal: there doesn’t seem to be clear understanding between the team on when to move up the pitch together, or what the triggers are to really up their intensity. Against Everton, that natural cautiousness meant Arsenal were able to retain a compact shape and cut out the passing lanes to Lukaku. Still, there were moments when the body twitched, and in that sense, it’s a tortuously fascinating experience to watch Arsenal grapple with the concepts of moving and reacting as a team together, as if Wenger asked them to analyse ten Salvador Dali paintings before sending them out on the pitch. Thankfully against Everton the shape was more promising and the line just the right height not to allow Romelu Lukaku the chance to run behind. Still, Gabriel and Laurent Koscielny were diligent in their efforts to mark Lukaku, often following the striker across the pitch. It’s undoubted that having the two centre-backs in the backline aids Arsenal’s pressing strategy, to get the team up the pitch, because both players love to intercept and win the ball back early. In Wenger’s pressing game, whole team essentially has to man-mark and get tight, and Gabriel and Koscielny’s style might just be the platform to transform Arsenal into a better pressing outlet. 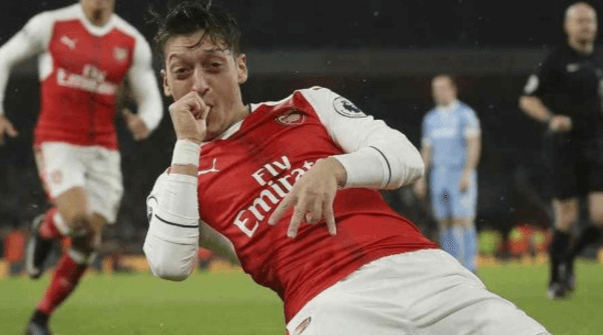 Once Arsenal settled, the game proved to be an intriguing, if not entirely entertaining, example of how two sides noted for their treatment of the ball, can be so different. What the match showed is that possession football is diverse – as diverse as the game itself (as everybody passes the ball) – and that there is no such thing as a single, homogeneous style of build-up play. Arsenal’s style is mainly position-based, and as such, it’s easy to identify the typical passing lanes. The centre-backs pick up the ball and look to feed one of the midfielders, in this case Francis Coquelin and Santi Cazorla (though neither is as adept in deep positions as the absent Mikel Arteta. Coquelin is improving, though he’s far from a prober, rather a player who uses his first touch to open up passing lanes), who in turn has the option of passing it to a myriad of attacking players who have committed forward in front of him. With this approach, Arsenal look to have as much of the play in the opponents half as possible and it’s up to the players, based on a know-how accumulated over time and matches, to find solutions. Everton on the other hand, have the majority of their play at the back and are happy for it. Instead, they look to work space patiently by stretching the pitch as wide as possible in the hope that eventually, this will create a bit of space for one of the midfielders in the 4-3-3 to find a killer pass. In this game, Arsenal were much better equipped, and with the attacking quality they have, looked to get them combining as often as possible quickly in tight spaces. The way Arsenal do this is by creating a numerical advantage on one part of the pitch by committing an extra man to the build up. * Naturally that suits Ozil, who loves to drift into the channels, though with Alexis going the other way, found it more fruitful to move to the left. Kieran Gibbs would then come haring down the touchline to offer an outlet to play a penetrative pass forward, or wait for Santi Cazorla who would push forward to create an extra man. The aim is to create numerical advantage through overloads; situations of 3v2, 2v1, or 4v3, particularly in tight spaces and then suddenly break through with a incisive pass or late run. There was was a bit of apprehension about Arsenal’s play against Everton that meant they didn’t quite profit from these moments as they might have, (because those moments against Monaco were when Arsenal over-committed) though the best moments that wasn’t goals featured such build-up. Hector Bellerin’s blocked chance halfway through the first half and two Santi Cazorla long range efforts a few such examples. In the end, Arsenal showed the special quality that they have above Everton to make the difference; Olivier Giroud’s expert finish and then Ozil’s fantastic cutback to find Rosicky which sealed the win. “At Arsenal, we do a lot of exercises where you have to play through the mannequins, but you can use cones. This is a great drill because it’s real; you’re moving and finding the holes to play the diagonal pass, just like in a match. The drill starts with player one passing the ball through two mannequins to player two, who with one touch steps through the next two mannequins. He then passes the ball to player three on the outside. Player three returns the pass and begins his run around the three mannequins, forming a triangle. Playing one-touch football, player two and three exchange passes between mannequins one, two and three. Once player three has run past mannequin three he plays the ball back to player two and sprints around mannequins four and five. Receiving the pass, player two takes one touch through the mannequin gate and plays a diagonal pass to player three as he runs past mannequin five. The process repeats itself, with each player swapping positions in a clockwise direction. This drill will help you during a game when out to create two versus one situations against a defender.